Post-operative haemorrhage is a common complication that can occur after any surgical procedure. In this article, we shall look at the types of haemorrhage, their clinical features, and their management. Clinical features of haemorrhagic shock* include tachycardia, dizziness, agitation, visible bleeding, or decreased urine output. One of the most sensitive signs is a raised respiratory rate. *Hypotension is often a late sign – do not assume a patient is ‘stable’ or not bleeding just because their blood pressure is normal. Examination of the patient should include a thorough exposure looking for bleeding, systematic palpation of the surgical area looking for swelling, discoloration, disproportionate tenderness, and any peritonism. Review the observations and grade any degree of shock (see table 1). If there is a clinical suspicion of post-operative bleeding, fast and efficient initial management will reduce overall morbidity and mortality. An A to E approach is advised, taking particular care to ensure adequate IV access (an 18G cannula as an absolute minimum, ideally larger) and rapid fluid resuscitation. Upon review with a senior, it may be appropriate to re-operate on the patient for further haemostasis. Conservative management may be indicated in smaller haemorrhages but close monitoring should always be undertaken. Post-operative thyroidectomy or parathyroidectomy haemorrhage can have catastrophic consequences and the surgeon must take great care to ligate any vessels and coagulate bleeding points. The primary sign of post-operative haemorrhage is likely to be airway obstruction. This is because the pretracheal fascia of the neck will only distend so far; when bleeding occurs into this space, compression on the venous return results in venous congestion, with subsequent laryngeal oedema leading to eventual asphyxiation. Any evidence of respiratory distress or airway compromise in these patients requires an emergency protocol for airway rescue. This involves removing both the skin clips and deep layer sutures and suction of the haematoma beneath, all done at the bedside as there is no time to get the patient to theatre! Urgent senior surgical opinion should be sought and an anaesthetic review should be organised. Figure 2 – Anatomical course of the inferior epigastric artery. 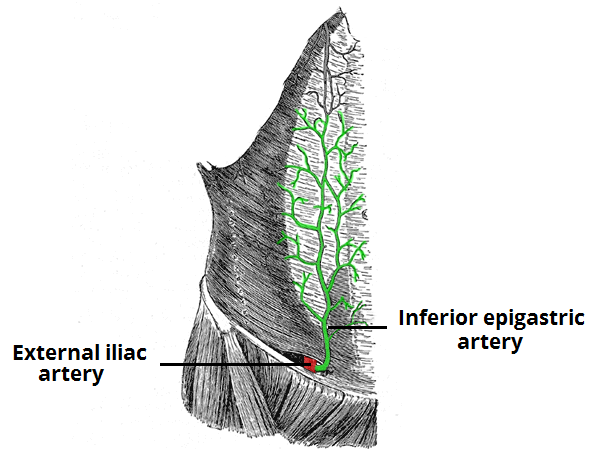 The inferior epigastric artery arises from the external iliac artery and runs up the abdominal wall below the rectus muscle, vertically in approximately the mid-clavicular line (Fig. 2). It is therefore vulnerable to injury from laparoscopic ports. Due to the gas insufflation, this may not be noticed at the time of surgery. Always think of post-operative bleeding and inferior epigastric artery injury in an acutely unwell patient shortly after any surgery, but particularly after laparoscopic surgery or surgery with a Pfannenstiel incision. Many procedures are now performed using angiography, with an entry site in the groin. The puncture site is often the external iliac artery, above the inguinal ligament. Therefore, any bleeding from this artery will go into the retroperitoneum. There will likely not be a large haematoma around the skin puncture site, because the actual arterial puncture site is hidden by the inguinal ligament. These patients often also bleed profusely because tamponading the injury is difficult. For any suspected occult retroperitoneal haemorrhage, apply pressure to the puncture site, resuscitate the patient, ensure blood products are made immediately available and call for senior support. Which statement accurately describes reactive bleeding? What is considered the most sensitive initial sign of haemorrhagic shock? Which variable is NOT included in the classification of shock? 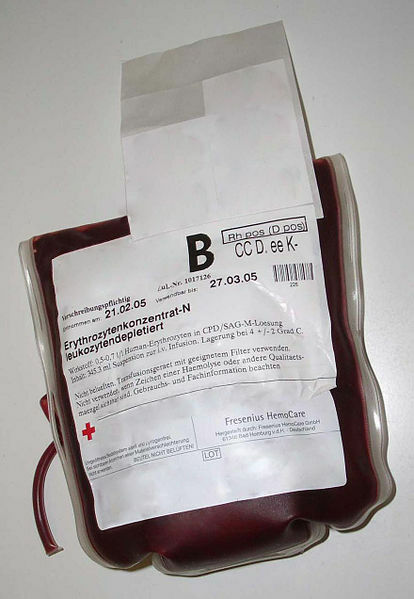 A patient has a post-operative haemorrhage of 1750ml. Which class of haemorrhage shock are they? A patient has a post-operative haemorrhage. Their heart rate is 110, respiratory rate 25 and urine output 6ml/hr. What class of haemorrhagic shock are they? What is the primary sign of post-operative haemorrhage following neck surgery? Which artery is vulnerable to injury from insertion of laparoscopic ports?